This attractive wood lecturn has the option of adding a wood cross to the front, as depicted in the alternate image. It has a spacious top shelf and a built-in shelf underneath. 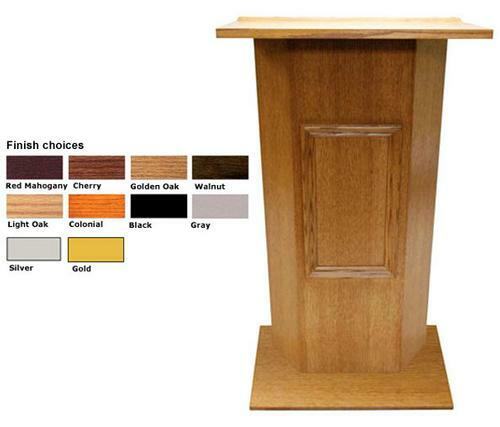 It ships fully assembled and is available in ten finishes: red mahogany, cherry, golden oak, walnut, light oak, colonial, black, gray, silver and gold. Dimensions: 46" H x 26" W x 16" D.
This attractive wood lecturn has the option of adding a wood cross to the front, as depicted in the alternate image. It has a spacious top shelf and a built-in shelf underneath. It ships fully assembled and is available in ten finishes.